Chocolate is a food made from the beans of cocoa trees that are native to Central America and the Amazon River basin of South America. The cocoa bean is intensely bitter on its own, but through a series of processes it comes to be the chocolate we know and love. 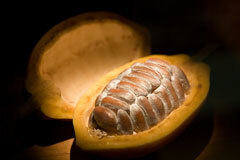 The highest quality cocoa is made from Criollo species trees, which produce a more aromatic and less bitter bean, but most cocoa is derived from the hardier Forastero species trees, which are more widely cultivated. Chocolate liquor is non-alcoholic; it is actually the term used for the middle of the bean after it is ground up into liquid. Cocoa butter is the fat extracted from the chocolate liquor. Cocoa powder is the solid left after pressing the cocoa butter out of the liquor. It may undergo a Dutch process, which reduces its acidity, making it into the cocoa that is best for hot chocolate. 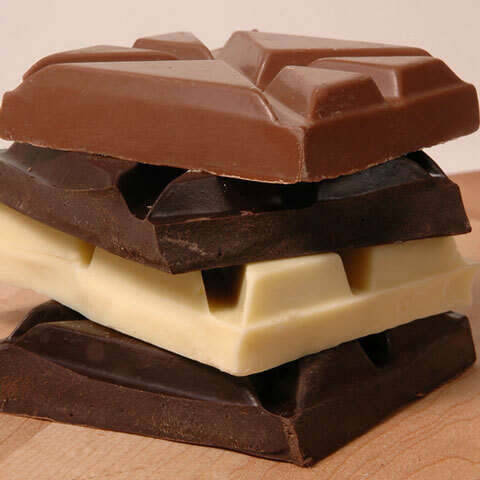 Different types of chocolate include unsweetened chocolate, bittersweet chocolate, semi-sweet chocolate, dark chocolate, milk chocolate, and white chocolate. Unsweetened chocolate is often used in baking and is the solid form of chocolate liquor. Bittersweet chocolate is also most often used in baking, and it has a minimum of 50% chocolate liquor, while semi-sweet chocolate contains a minimum of 35% chocolate liquor. Dark chocolate contains only 15% chocolate liquor, as well as sweeteners and cocoa butter. By far the sweetest of the darker chocolates, milk chocolate has at least 10% chocolate liquor and 12% milk solids mixed with sugar, vanilla, and cocoa butter. White chocolate is made of cocoa butter, sugar, and milk solids, and lacks the brown color because it does not contain any cocoa solids. To read more about chocolate and its history, visit Cadbury's History of Chocolate web page.